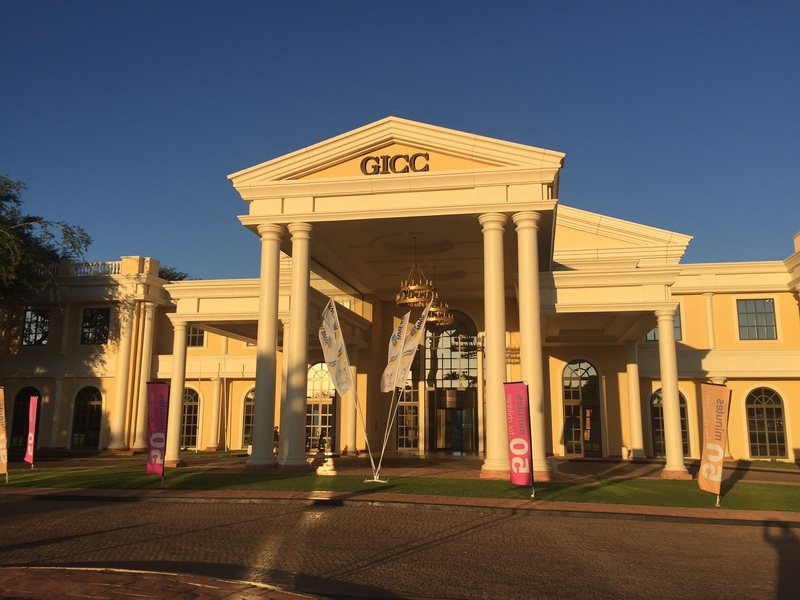 The finalists for the Innovation Prize for Africa gathered at a gala dinner last night at the Gaborone International Convention Centre (seen at right) to hear who would be the winners for 2016. Among the ten innovations that celebrated African ingenuity were products in the fields of energy, agriculture, education and healthcare. To great applause, the grand prize of $100,000 was awarded to Valentin Agon of Benin who has developed an anti-malarial drug manufactured from natural plant extracts. 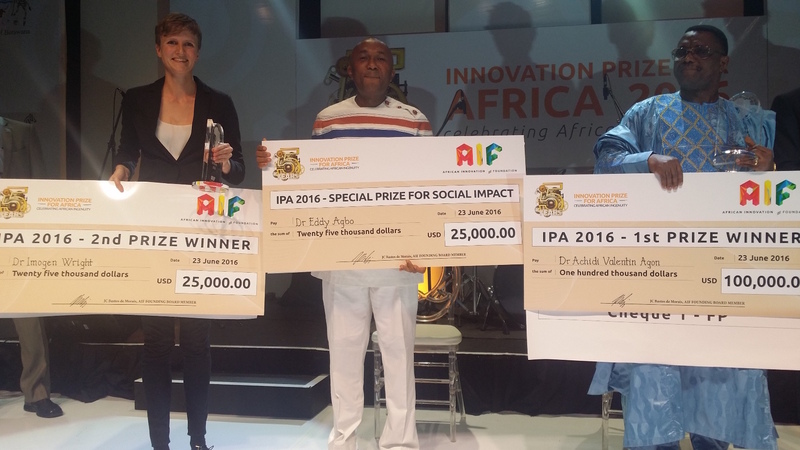 The second prize of $25,000 went to Imogen Wright of Cape Town whose software allows the determination of HIV patients’ response to anti-retroviral drugs, while the social impact award – also for $25,000 – went to Eddy Agbo of Nigeria for his urine-based malaria test (see the winners below). Walter Fust, chairman of the African Innovation Foundation (AIF) emphasized that all ten finalists were winners, with each taking home a cheque for $5,000. The journey that culminated in the trip to Botswana was an arduous one, both for the competitors and the adjudicators. There were 985 online applications submitted and accepted in October 2015, and these were slowly whittled down so that by early May 2016, the final ten had been selected. Contestants and judges assembled in Gaborone on Sunday 19 June and the next two days were hectic, including media training, video interviews and a one-hour pitch to the judging panel by each finalist, who had been asked to prepare answers to various questions, such as: What problem does your innovation solve? How important is your solution for Africa? Have you protected your intellectual property? What have you done to minimise risk? After the pressure of the interviews was behind them, contestants assembled on the campus of the Science and Technology Park – still under construction – that will be the new home for the Botswana Innovation Hub. There they set up exhibits and had the opportunity to participate in various workshops, including intellectual property rights and writing a business plan. A special highlight was the launch of a book called Seed, published by AIF that celebrates African creativity. One of the benefits of IPA 2016 will be CapeRay’s ongoing association with Djembe Communications who are committed to assisting us with our marketing efforts. So, although CEO Kit Vaughan did not return to Cape Town with one of the main awards for Aceso – our dual-modality system for the early detection of cancer in women with dense breast tissue – we are now firmly embedded within the African innovation network. Sorry Kit that you did not make it. Even more sorry about the sense of uncertainty following Brexit. Could you believe that most people in Europe do not care? England is not a very convincing partner. And since it joined the EU (sorry we were a little late), it never was. We all remember Margaret Thatcher. No celebration, nothing for us. Let us celebrate the freedom of choice. We all define nowadays the ones by which we are governed, whether they are English or not. Cheers to Northern Ireland and Scotland. The grand prize of $100,000 was awarded to Valentin Agon of Benin who has developed an anti-malarial drug manufactured from natural plant extracts. This is certainly a step forward in the treatment of a disease that carries off millions of people in Africa each year. The problem in the whole of Africa is, unfortunately, tribalism, lack of education, superstition , poverty, unemployment, with concomitant crime and corruption. As a misanthrope, I cannot help wondering how effective this treatment will be? Clean running water, electricity and a host of other items is what might assist an ever-expanding population. PS: What sort of double-blind studies were carried out? Hard lines CapeRay – you can never tell what the judges guidelines were. Your reward was getting into the top ten, which will do well on the world stage.